The teaching materials for the learning experience on “The Plan of Salvation” are divided into three parts. Part 3 contains a cumulative doctrinal mastery review activity. This review activity should not take longer than 20 minutes. If you did not have time to cover all of the material from parts 1 and 2 of this learning experience, consider also teaching that material during this class session. If you finished teaching the materials from parts 1 and part 2, you could use the remainder of your time in this class session reviewing material from regular sequential scripture lessons in the Doctrine and Covenants. 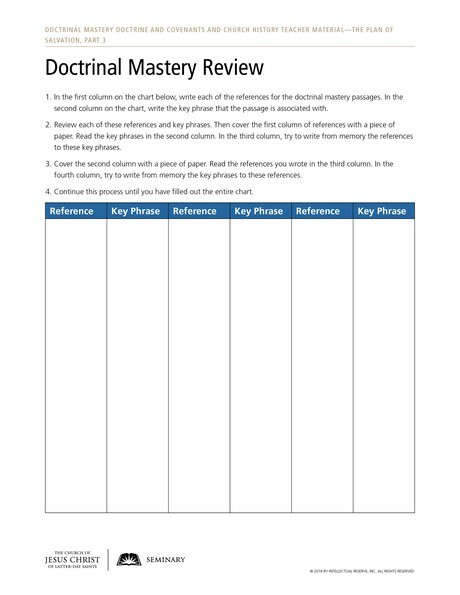 Take a few minutes to review the doctrinal mastery passages and their key phrases, and then provide the accompanying handout to each student. Read the instructions aloud. In the first column on the chart below, write each of the references for the doctrinal mastery passages. In the second column on the chart, write the key phrase that the passage is associated with. Review each of these references and key phrases. Then cover the first column of references with a piece of paper. Read the key phrases in the second column. In the third column, try to write from memory the references to these key phrases. Cover the second column with a piece of paper. Read the references you wrote in the third column. In the fourth column, try to write from memory the key phrases to these references. Continue this process until you have filled out the entire chart.